The University of Evansville's Mad Hot Ballroom program won the Sam Featherstone Award for Projects and Programs at the annual Celebration of Leadership Awards hosted recently by Leadership Evansville. Erin Lewis, associate director for the Center for Innovation and Change at UE, is the club's advisor and Joseph Shoup is president. The University of Evansville launched its inaugural Community Changemaker Challenge today during a press conference on the UE campus. This competition’s theme is to Make Evansville More Fun and Exciting, and community members of all ages and backgrounds are invited to form a team. After a series of initial rounds, the top four teams will each receive $1000 in prize money. Teams will then hone their presentations for the final round—a “Shark-Tank”- style competition to be aired on WNIN. During the televised event, each team will have the opportunity to make a pitch to real community investors for funding up to $10,000. UE has hosted the annual High School Changemaker Challenge since 2015, awarding full-tuition scholarships to members of the winning teams and the Collegiate Changemaker Challenge since 2013, awarding prize money and other incentives to UE students. Both of these programs are designed to motivate young people to take a leading role in identifying and solving challenges in the world around them through innovation and creativity. Many Changemaker Challenge projects have already been implemented throughout the Evansville community. The Upgrade Bike Share hubs around the city, solar panels at Carver Community Center, and the CommuniTree at Mickey’s Kingdom all stemmed from these competitions. In addition to WNIN, other community partners involved in the challenge include the Rotary Club of Evansville, Leadership Evansville, the Evansville African American Museum, and the Growth Alliance of Greater Evansville. Interested teams are invited to two information sessions in February, and video submissions are due April 8. The top 12 teams will each present at a pitch event on April 30. The top four teams from this event will each receive a prize of $1,000 and will be invited to the WNIN studios on June 7 for the recording of the final televised round where they will pitch their ideas to local community investors for further funding assistance, suggestions, and advice for implementation. Join Leadership Evansville for a VOICE session at the Evansville African American Museum. They will help you come up with ideas or hone an idea if you already have one! Refreshments provided and all are welcome. Come to the information session to learn details and discuss strategy for the competition. Email a YouTube link to your team’s 60-second video pitch to centerforinnovation@evansville.edu by midnight. Friday, April 12: Top 12 Teams Notified that they’ll be moving forward. Tuesday, April 30: Top 12 Pitch Event at Innovation Point: Each team will deliver a one-minute pitch and then be available to discuss their ideas further. The top 4 teams will be invited to the WNIN studio to receive their $1,000 prize and to pitch their idea to investors for further funding assistance, suggestions, and advice for implementation. For more information visit www.evansville.edu/cc. University of Evansville ChangeLab students are planning an awareness event for their Powering Rosa-Bell project, which will provide solar panel-powered energy for the Rosa-Bell school in Puerto Rico. The event is Tuesday, December 11, at 5:00 p.m. in Room 100 in the Koch Center for Engineering and Science on UE’s campus. It is free and open to the public. There will be food, prizes, a panel discussion, and trivia games focusing on climate change and the environment, alternative energy, and Puerto Rico. The students will also make presentations about their project, and there will also be an informal discussion of the recent fourth national climate report. Currently, electricity for the Rosa-Bell school comes from a standard power grid. When Hurricane Maria hit Puerto Rico in 2017, the grid lost power causing the school to be out of session for several months. The goal of the Rosa-Bell Project is to raise the money needed to purchase materials for the installation of solar panels, so the school no longer relies on the power grid. It is estimated that electricity generated by solar panels would save the school approximately $5,000 a month. This money could go to new programs, new classroom supplies, and an overall improvement of the school for the students. The University of Evansville’s inaugural Changee Awards ceremony was Sunday, October 28, in Eykamp Hall in Ridgway University Center on UE’s campus. The formal event, sponsored by Toyota Motor Manufacturing, Indiana and Berkshire Hathaway real estate agent Philip R. Hooper, honored those in the UE community who have been outstanding changemaking catalysts. Three students from North High School won full tuition to the University of Evansville today during the fourth annual High School Changemaker Challenge. Ashlyn Thompson, Jaylyn Davis, and Jamie Born came up with an idea for a musical swing set that would serve as a stress reliever and community builder in downtown Evansville. The team researched what it would take to make their idea become a reality and presented to a panel of judges. Championship round judges included Evansville Mayor Lloyd Winnecke, UE president Christopher M. Pietruszkiewicz and other community leaders. UE's High School Changemaker Challenge is designed to motivate young people to take a leading role in identifying and solving challenges in the world around them through innovation and creativity. High school students are invited to pitch their ideas to a panel of community leaders and compete for scholarships to UE where they can come to get the support needed to make their ideas become a reality. This year, 18 teams from the following high schools competed: North, Evansville Day School, Heritage Hills, Bosse, New Tech Institute, Forest Park, Signature School, Evansville Christian School, Mater Dei, Castle, Central, Boonville, and Charles A. Tindley Academy. The High School Changemaker Challenge was made possible this year by the Rotary Club of Evansville. Proceeds from the 2017 Rotary Club Santa Run went to support the Changemaker Challenge. 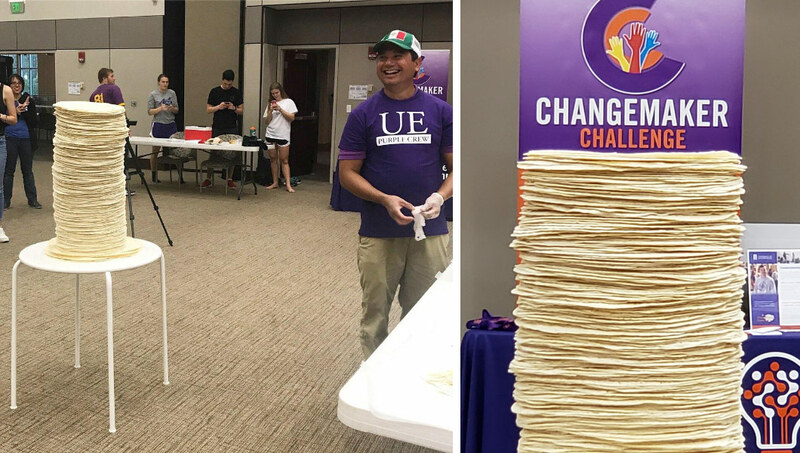 UE’s Mark Valenzuela broke the world record for stacking the tallest tower of tortillas on Friday, September 7 during UE Changefest 2018. He not only broke the existing record of 68 centimeters, but went on to set a new record of 75 centimeters before his tower fell. This was Mark's second attempt. In last year's attempt, his tower toppled just short of the world record. "Mark exemplifies the characteristics of changemaking that UE stands for," said Jill Griffin, executive director for the Center for Innovation and Change at UE. "He had the courage to set a bold goal for a good cause and wasn't deterred by his initial failure." ChangeFest is held annually to raise awareness for the positive change that Aces are making in the community and the world. 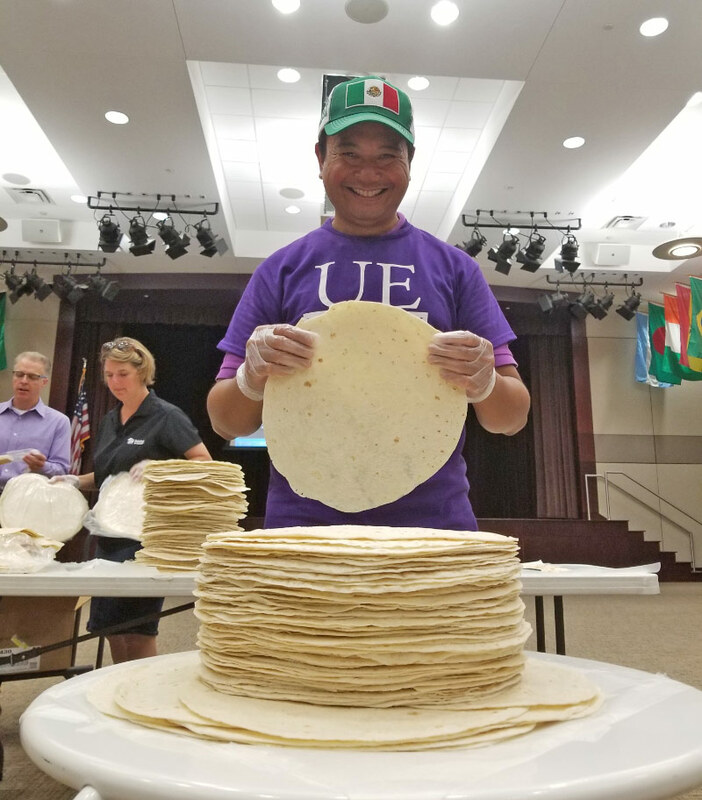 This year's themed booths, salsa dancing lessons, record breaking tortilla tower, and more revolved around the theme to bring awareness for UE's upcoming Habitat for Humanity trip to Mexico. Valenzuela is the associate vice president for academic affairs and is also teaching a ChangeLab course this semester in which students are exploring the use of tiny hones as a source of affordable housing. He recently moved into his current role after teaching in the mechanical and civil engineering department for 19 years. The University of Evansville’s Access to Capital and Expertise for Emerging Entrepreneurs (ACE³) program has been selected as a Pioneer (finalist) in the Unlocking ₵hange Challenge: Innovations for Financial Wellbeing, Resilience, and Freedom. This nationwide competition seeks to find and support leading social entrepreneurs and innovators across the country. The ACE³ program was one of 10 finalists chosen out a group of 140 entries. The four Champions (winners) of the challenge will be announced on Oct 3. Each winner will receive $50,000 to support their programs. Representatives of ACE³ will soon be going to New York to attend the Unlocking ¢hange Challenge event. While there, they will have the opportunity to network, participate in workshops, and discuss the Ace³ program, sponsored by Old National Bank. The challenge is a collaboration between BNY Mellon, an American worldwide banking and financial services holding company, and Ashoka, the world’s largest group of social entrepreneurs and changemakers. The University of Evansville was recently named a Changemaker Campus by Ashoka U, an Ashoka initiative. UE received the recognition due to its leadership in social innovation and changemaking in higher education. It’s one of 50 universities world-wide with this distinction and the first in Indiana. The ACE³ program is sponsored, funded, and co-managed by Old National Bank and is located in the Schroeder School of Business’s Institute for Banking and Finance under the direction of Yasser Alhenawi, UE associate professor of finance. ACE³ manages a $100,000 portfolio, which offers microloans to women, minority, and disadvantaged owned businesses. Students interface with clients, review business plans, and serve as underwriters for loans. “ACE³ gives students the opportunity to gain invaluable skills and real-world experience while making a positive impact in the community,” said Greg Rawski, Schroeder Family Dean. 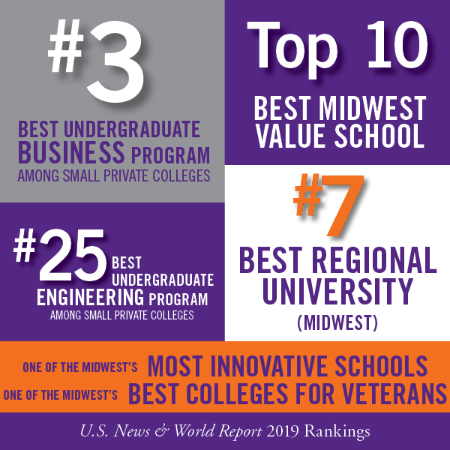 The Schroeder School of Business is the nation’s fastest riser (+38 places) in the 2018 U.S. News & World Report Best Undergraduate Business Programs and is ranked Number 4 among small private business schools nationally.